Community - Tree Solutions Inc.
Scott Baker has participated in the Tour des Trees (a week-long, 500+ mile bike tour) several times. We continue to donate to this cause annually, supporting fellow riders as they raise money for the Tree Research and Education Endowment Fund (TREE Fund). 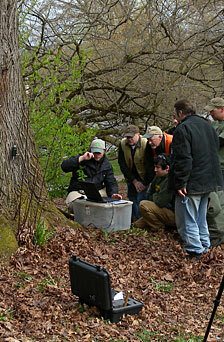 In April, 2009, Tree Solutions Inc. donated their time to test three trees in the UW Botanic Gardens / Washington Park Arboretum in Seattle. We used sonic tomography, a recently developed device from Fakkop Enterprise of Hungary that uses sound waves to detect decay in a tree. We were thrilled to have had this opportunity to use the most up-to-date technology for the means of assisting in the preservation of the Arboretum's large trees. PDF: Tree Services Magazine. "Community Collaboration." Benson, Jenan Jones. May 2009.